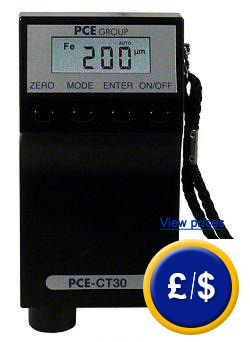 The PCE-CT 30 thickness gauge measures coating thickness on steel and non-ferrous metals without damaging the surface. The menu and adjustment for new parameters can convert the PCE-CT 30 thickness gauge into an indispensable device for checks during production, in workshops as well as the in quality control. The ergonomical shape of the thickness gauge and its integrated sensor make this device easy to use to ensure quick and accurate readings. It has been designed for measuring non-magnetic coatings such as lacquer, plastic, copper, chrome, zinc and enamel on steel and iron, as well as insulating coatings such as lacquer, plastic, enamel, paper, glass and rubber on copper, aluminium, brass, stainless steel and anodised aluminium. This link shows all types of thickness gauge we have available to suit your needs. - Wide measurement range from 0 to 3.5mm. - Can take continuous measurements. - Measurements are not influenced by vibrations. - The "V" slot simplifies measurements on curved surfaces such as axles. - Optical alarm for measurements on unknown base materials. - Comfortable to use with only one hand. - Selectable units of measurement of either µm or mm. - Turn on and off either automatically or manually. - Contents include thickness gauge with battery, carrying case with the calibration standard and user's manual. Here is the PCE-CT taking a measurement. The thickness gauge is used predominantly in the automotive industry. Everyone who has bought a car that, apparently, has never been involved in an accident, knows the problem of discovering that an area shows major damages. It is not necessary to be an expert in materials, but it would be helpful to have the ability to determine if a car has been damaged and then repaired. The PCE-CT 30 thickness gauge is the solution for an easy determination of the condition of body work on a car. Simple select the type of base material, either steel or aluminium, place the device on the area that you would like to measure and the reading will tell you if the coating of paint is uniform and to the correct thickness that is applied originally by the manufacturer. In cases where body filler were used, the coating on the metal will be more than one millimeter. The PCE-CT 30 thickness gauge as a range of 0 to 3500 µm (3.5mm). In cases where abnormal thickness are determined, it would be time to question the condition of the car and to act with caution. 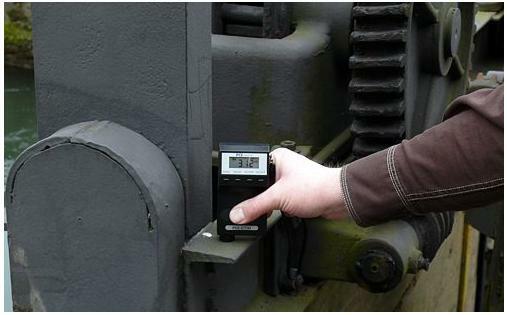 The thickness gauge can also be used in every industry with the need to measure the thickness of coatings on ferrous or non-ferrous materials. An example of this is galvanizing. To ensure that the thickness gauge is shows the correct reading, you will find a calibration standard included with the device. An optional ISO calibration can be ordered to ensure that the readings meet ISO standards. The certificate includes the measurement values and the serial number of the device. There is also a testing plate that will help to determine if a recalibration is required. - ISO calibration certificate (for companies that wish to incorporate the thickness gauge into their set of ISO quality control tools. You can obtain it with your initial order or with your annual recalibration. This ensures a high level of accuracy).